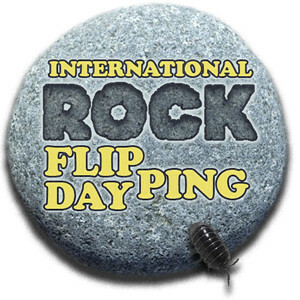 Just a reminder, International Rock Flipping Day 2012 is coming up on September 9. The full details are here, but basically in order to participate you need to flip a rock on or about September 9, record what you find (photo, haiku, do what you want), put the rock back how it was, and post your findings online. Twitter hashtag is #rockflip or #irfd, or there’s a Flickr group, or you can do a blog post and send the link to wanderinweeta(AT)gmail(DOT)com. Be sure to check out my rock-flipping posts from 2011 and 2010. Author RebeccaPosted on Friday, August 17, 2012 Monday, March 25, 2013 Format AsideTags links1 Comment on A Sweet New Blog You Should Be Reading! For those interested, my first published freelance article is available online now. I’ve added a section to this blog’s “About” page with links to my writing elsewhere on the internet (right now, it’s just this article plus a couple guest posts I’ve written for other blogs). Hi all, just a quick note to tell you that I’m this week’s guest writer over on Michelle Cusolito’s blog, Polliwog on Safari – please go check out my post, called Two Ways of Seeing Trees. Michelle’s blog is primarily about connecting kids to the natural world and features a guest post every Tuesday. Author RebeccaPosted on Tuesday, May 29, 2012 Thursday, March 28, 2013 Format AsideTags links1 Comment on I’m a Guest Blogger! First: Kristen, a woman I went to university with, is spending the next year studying bats in Australia on a Fulbright Scholarship. She’s blogging about the experience at Winging It in Oz, and if you’re interested in Australia or in bats (and who isn’t??) you should definitely be reading. Second: Conserve School, the semester program for high school juniors interested in environmental stewardship that I am working for as part of my graduate fellowship, has an official blog of its own. If you scroll down you’ll find a post from August 29 that prominently mentions yours truly. I spent an interesting afternoon today supervising students hanging ribbons and hawk silhouettes on windows in an effort to reduce the number of birds killing themselves by flying into glass on campus. Photos later.